These elegant gluten free coconut cupcakes are made with real coconut chips ground into the sugar, plus coconut extract, for maximum coconut flavor. (…unless you’re allergic!) Assuming you can safely eat coconut, I think these moist and tender gluten free cupcakes will make a coconut lover out of pretty much anyone. Growing up, the only “coconut” I had ever tasted was the overly sweetened type of shredded coconut. It was something to be tolerated when it showed up on the bunny-shaped cake my father made for my sweet at-home birthday party. Coconut chips can be purchased dried and otherwise raw or even already toasted. I buy my chips now at my local Trader Joe’s, and I toasted whole bags and store them in a sealed glass container on the kitchen counter. They’re perfect for tossing into muesli or a quick batch of maple almond granola. Even though I love toasted coconut chips, I don’t care for the texture of them when it’s baked into cake. So, instead, in this recipe we process the raw coconut chips with granulated sugar before adding them to the batter. Combining the coconut with the sugar flavors the whole cake but still makes for a cupcake with a super tender crumb. If you don’t care about keeping the cupcakes themselves white inside, you can toast the chips before combining them with the sugar for a stronger coconut taste. These cupcakes make a lovely presentation even though they don’t have any bright colors at all. The contrast between the super white frosting and the white cakes with the golden brown edges on the cupcakes and the toasted coconut chips is really special. Since the coconut in these cupcakes is really prominent, and the coconut chips are rustic, I really like to frost these in a “messy” way. You can do that by piping frosting on top of each cupcake with a large open piping tip and then smashing it down a bit. You can also just use a large offset spatula or large spoon and place a large dollop of frosting on top. A highly designed, precious style of frosting just doesn’t seem to fit with these cupcakes. I think they’d also be lovely with a few edible chicks nestled on top of the frosting for Easter. Dairy-free: When I first made these cupcakes in 2012, the cupcake recipe itself was made with virgin coconut oil, not butter. 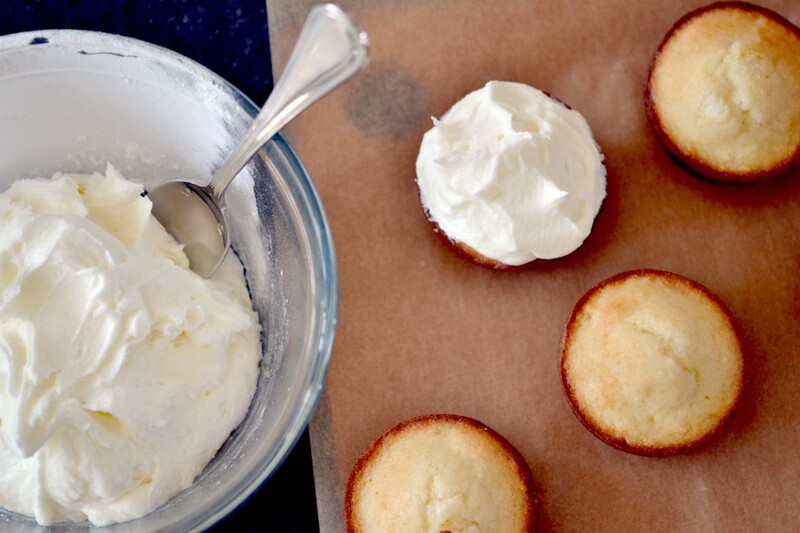 I switched to butter because it’s easier to beat until it’s light and fluffy, which makes for a lighter cupcake. Plus, the virgin coconut oil I buy these days is triple-filtered, so it has no coconut flavor or odor anyway. But this recipe does still work if you use virgin coconut oil in place of the butter. For best results, though try using half virgin coconut oil (the kind that is solid at cool room temperature) and half Spectrum nonhydrogenated vegetable shortening. They’ll be easier to beat with the sugar and egg whites until light. In place of the butter in the frosting, I’d use Spectrum butter-flavored nonhydrogenated vegetable shortening. In place of the buttermilk, I recommend trying half plain coconut yogurt (by volume) and half unsweetened coconut or almond milk (not the can, the carton). Whisk well and it will be a great substitute for buttermilk. Egg-free: In place of the egg whites, I would try using aquafaba. That’s just the liquid from a can of chickpeas (garbanzo beans). I haven’t tried this substitute in this particular recipe, but I’m optimistic about it. Preheat your oven to 325°F. Grease or line a standard 12-cup muffin tin and set it aside. To make the cupcakes, place the granulated sugar and coconut chips in a blender or food processor, and pulse until the coconut chips are no longer visible, and have become part of the sugar. The sugar will clump a bit. Set it aside briefly. In a small bowl, place the flour, xanthan gum, baking powder, baking soda, and salt in a small bowl and whisk to combine well. Set the dry ingredients aside. In a large bowl, place the butter, prepared coconut and sugar mixture, egg whites and optional coconut flavoring, and beat very well with a handheld mixer. Add the flour mixture in two parts, alternating with the buttermilk in between parts and beating until just combined after each addition. Using a silicone spatula or large spoon, turn the batter over by hand a few times to ensure that all of the dry ingredients have been incorporated into the batter. The batter should be relatively soft but thick and a bit lumpy. Fill the prepared wells of the muffin tin just under 3/4 of the way full with batter. Shake the tin back and forth to evenly distribute the batter in each well. Place the cupcakes in the center of the preheated oven and bake until very lightly golden brown and the top springs back when pressed gently in the center (about 18 minutes). Remove the muffin tin from the oven and allow the cupcakes to cool for about 10 minutes in the pan before transferring to a wire rack to cool completely. Lower the oven temperature to 250°F. Place the remaining 2 cups of coconut chips on a clean, rimmed baking sheet and spread them into an even layer. Place in the center of the oven and bake until lightly toasted, about 7 minutes. Stir at least once during baking to ensure even toasting, then remove the toasted coconut chips from the oven and allow to cool. Make the frosting. In the bowl of your stand mixer fitted with the paddle attachment, place the 8 tablespoons butter and 6 tablespoons coconut oil and beat on high speed for about 3 minutes or until light and fluffy. Add the confectioner’s sugar, pinch of salt, and (optional) coconut flavoring, and beat on high speed until the frosting is very light and fluffy again (about 10 minutes). Once the cupcakes are completely cool, place a generous dollop of frosting on top of each with a spoon or using a pastry bag fitted with a large open piping tip. Press down on the frosting with the spoon to create a small well in the center of each. 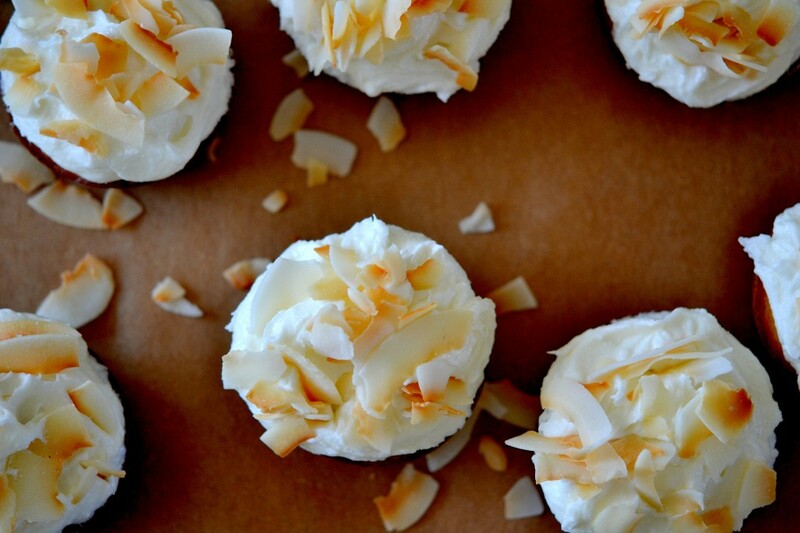 Sprinkle the cupcakes generously with the toasted coconut chips. Originally posted on the blog in 2012. Photos all new, video new, text new, recipe altered to make only 12 cupcakes and make cupcakes with a lighter crumb. These look so good! I appreciate the substitution for dairy and eggs as well, that really helps those who have additional allergies or diets!! These look so good, have never tried lended or processing coconut chips up! Shouldn’t 1/2 c buttermilk be 4 fluid ounces? I Love all your recipes, thank you for all you hard work testing new recipes . RE: buttermilk. You said in a follow up comment that you corrected it. But amounts don’t equal. It says half cup (8 fluid oz.).. But of course half cup is 4 fluid oz. thanks for recipes! You are my go to source after recently being diagnosed with Celiac. Yes yes yes Janet. Please accept my apology and thank you for pointing out my mistake. I hope no one made them wrong!! Hi, Karin, thank you so much for picking up on my mistake! I’ve added the amount now. It’s 1/2 cup (4 fluid ounces) buttermilk, at room temperature. How much aquafaba should i use to replace the egg whites? I tried using the same weight when i tried your Perfect Gluten Free White cake and it failed miserably. Oh no! That’s so disappointing that it didn’t work, Beth. If you’re willing to do some more experimentation, I’d recommend using the same amount again, by weight, but instead of just beating it into the butter and sugar, whipping the aquafaba into soft peaks and then folding it into the batter at the end. But definitely cut the recipe in half when you’re experimenting so you don’t waste as much. I L-O-V-E large coconut flakes, as I call them. Same as your chips, just a different way of referring to them (a rose by any other name, right?). I’ve spoken out against the sticky-stringy, too… Coconut in a can is just wrong. Oh, no doubt they’d be fast friends, Gigi. Seriously, the stringy stuff isn’t even really coconut-seeming. Who knows what that stuff is. Whatever it is, it has given coconut a bad name!